I decided to set aside my beloved brownies for a day in favor of blondies. And if that wasn't enough against my character, I didn't even put any chocolate in them *gasp*! I guess it's opposite day here at Back For Seconds. I am starting to come around to the light side! 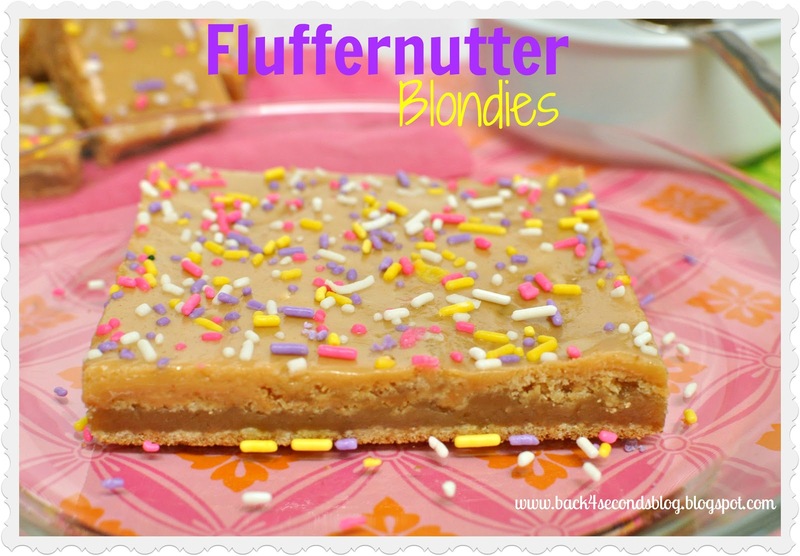 These blondies are GOOD They are gooey and chewy just like my favorite fudge brownie - but without the chocolate. I melted the butter and beat it with the brown sugar for a good long time and that gave these bars a nice caramel undertone. The peanut butter swirl baked inside paired with the fluffernutter frosting had me in peanut butter heaven! One bite of these and you will be feeling all nostalgic like. Did you ever have fluffernutter sandwiches as a kid? I bet you ate them on white bread, too, huh? Go grab your mixer, a glass of milk, and some sprinkles, and let's get baking! In a large mixing bowl beat melted butter and brown sugar for about 5 minutes. Add eggs and vanilla and mix. Combine flour, baking powder, and salt in a separate bowl and slowly add it to the wet mixture beating until well combined. Spoon batter into 13x9" greased baking dish. 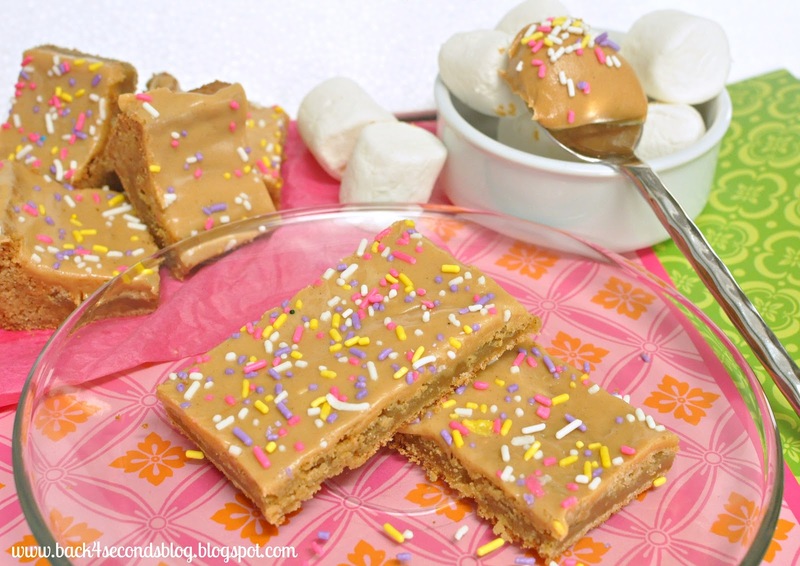 Soften peanut butter in microwave and drizzle over blondie batter, then use a knife to swirl it through the batter. Bake for 25-30 minutes. It is done when the edges start to brown and the center in no longer jiggly. Be careful not to over bake - you want these to be gooey and chewy! Frost while still hot. For the frosting, beat together all ingredients very well. It will be sticky. Spread over hot blondies and it will melt a little making it easier to frost. Cover and store at room temperature. Um, wow. Mouth watering. Stomach growling. Now I have a major craving! Another fabulous recipe! It looks sooo yummy. Please link it to the Pin'Inpsirational Thursday party http://www.addhousewife.com/2012/06/happy-happy-pininspiration-day-and-were.html pretty please! Okay, I'm drooling over here. 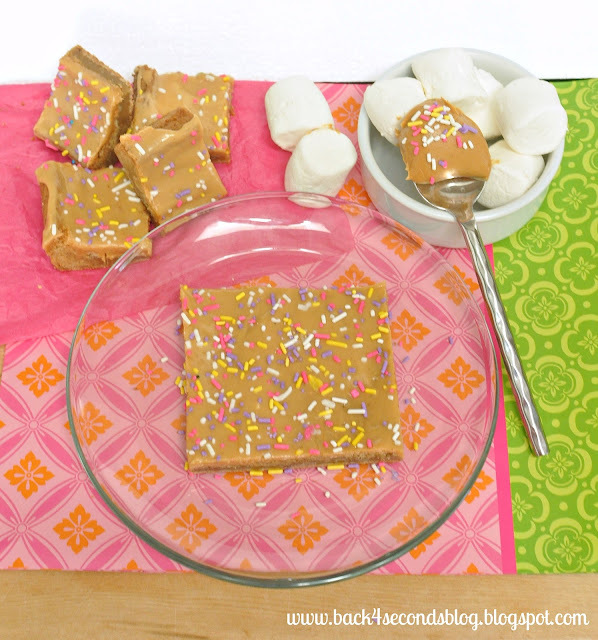 These look amazing--I love marshmallow fluff! Oh my gosh, I've gotta try this one! Pinning it for sure! FLUFFERNUTTERS!! I love them dearly, and these blondies. We all know blondies > brownies but these prove that point a little better :) and sprinkles. Sprinkles on everything. And I mean ev.er.y.thing. These look great! Thanks for sharing my blondies too :) YUM. Peanut butter and marshmallow....definitely would go over well in my house. Thank you for linking up the recipe fro Foodie Friends Friday. Hope to see you again next week. The frosting alone sounds awesome... thanks for sharing! Looks yum! These look like such a good escape from chocolate! Thanks for joining Food Friends Friday! Please join us again next week. I need this for breakfast!! Yum, love this recipe!!!! Pinning - because these look fabulous! yummy! so glad I found your blog on the red, white, and you linkup. I'm a new SAHM, so cooking daily is new to me-). Look forward to following! Those look ridiculous! Thanks so much for linking up at Mealtime Monday! Can’t wait to see what you like up tomorrow night!